Best to know one thing from the start about Old (Medieval) Town of Rhodes (Rhodos): It's not laid out on a grid -- not even close. There are roughly 200 streets or lanes that simply have no name. Getting lost here is not a defeat; it's an opportunity. 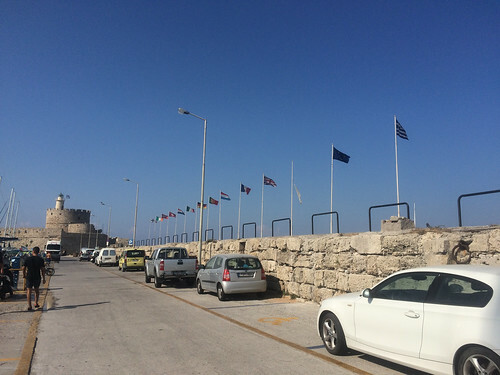 Whenever you feel the need to find your bearings, you can ask for Sokratous, which is the closest the Old Town of Rhodes comes to having a main street. When you approach the walls of the Old Town of Rhodes, you are about to enter the oldest inhabited medieval town in Europe. It's a thrill to behold. Although there are many gates, we suggest that you first enter through Eleftheria (Liberty) Gate, where you'll come to Plateia Simi (Simi square), containing ruins of the Temple of Venus, identified by the votive offerings found here, which may date from the 3rd century B.C. The remains of the temple are next to a parking lot (driving is restricted in the Old Town), which rather diminishes the impact of the few stones and columns still standing. Nevertheless, the ruins are a reminder that a great Hellenistic city once stood here and encompassed the entire area now occupied by the city, including the old and new towns. The population of the Hellenistic city of Rhodes is thought to have equaled the current population of the whole island (roughly 100,000). Simi square is also home to the Municipal Art Gallery of Rhodes, above the Museum Reproduction Shop (hours vary but are generally Monday through Saturday from 8am to 2pm; whose impressive collection is comprised mostly of works by eminent modern Greek artists. The gallery now has a second beautifully restored venue in the Old Town of Rhodes (across from the Mosque of Suleiman) to house its collection of antique and rare maps and engravings (open Mon-Fri 8am-2pm); and, within the next several years, it will expand into a new and third site located in the New Town. One block farther on is the Museum of Decorative Arts, which contains finely made objects and crafts from Rhodes and other islands, most notably Simi (open Tues-Sun 8:30am-3pm;). Continue through the gate until you reach Ippoton, also known as the Street of the Knights. Note: If you are ready for serious sightseeing, there is a ticket for 10¤ that gains admission to the Museum of Decorative Arts, the Archaeological Museum, the Church of our Lady of the Castle, and the Palace of the Knights. The Street of the Knights (Ippoton on maps) is one of the best preserved and most delightful medieval relics in the world. The 600m (1,968 ft.) - long, cobble - paved street was constructed over an ancient pathway that led in a straight line from the Acropolis of Rhodes to the port. In the early 16th century, it became the address for most of the inns of each nation, which housed Knights who belonged to the Order of St. John. The inns were used as eating clubs and temporary residences for visiting dignitaries, and their facades reflect the various architectural details of their respective countries. After touring the sites of the Old Town of Rhodes, you might want to walk around the walls. (The museum operates a 1-hr. tour on Tues and Sat at 3pm, beginning at the Palace of the Knights.) The fortification has a series of magnificent gates and towers, and is remarkable as an example of a fully intact medieval structure. Much of the structure can be viewed from just walking around the outside.